I'm so happy with how this turned out, and they are very easy to make and modify. You can also use decoupage, stickers, rhinestones and glitter to decorate. The shape I picked up was a bat shape. I love Halloween. Really truly. First I decided how I wanted it to hang from my strand of beads. Since it's a bat shape and the head is below the wing tips, I drilled holes on the wing tips. Removed the label, and sanded it smooth on both sides. Then painted one side, then the other with acrylic paint. I used DecoArt Metallic Blue with a bit of a purple mixed in. On the front, I sprinkled glitter on it. After that dried, I coated it with a thin coat of Mod Podge and let that dry. Repeat on the other side. I got some Mod Podge in the holes, and just used a scrap of wire to clean the holes back out while it was still wet. Then another slightly thicker coat of Mod Podge on the front, and I put the rhinestones on that. The rhinestones have a sticky back, but it didn't seem secure enough. Putting them in the Mod Podge made them a lot more secure. After that dried, put the jump rings in the holes and hang it from the strand of beads. Super easy, super quick. Now I want to get a lot more shapes and make a bunch more of these. I used my Fiskars craft drill . The craft drill is a nice non-powered option for wood and plastic and I use mine on resin, polymer clay, wood, plastic toys I want to make into beads and other light craft drilling. The beads I used were part of my collection of throw beads from Mardi Gras. I have hundreds of strands sent by friends hanging on my bedroom wall. For people who don't have hundreds of strands of Mardi Gras beads, you can get the same sort of beads at party supply places and sometimes at Claire's and other similar accessory stores. If you have lots of Mardi Gras beads you want to get rid of, you can send them to me! This is another fun project to do with kids. With very young kids, I used to use thick tempera paints with mine. I'd pick 2-3 colors that worked harmoniously together so they wouldn't turn to mud and I did the sealing. With slightly older kids, decoupage on simple shapes make very fun necklaces that can reflect interests. 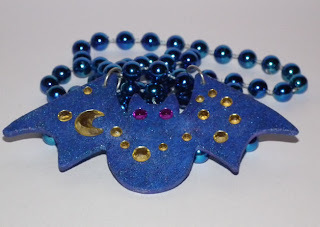 For tweens, teens and adults, almost any scrapbooking technique for embellishment will work on these sorts of necklaces. Cute and easy- I love it! Thanks so much, I'll be linking. This is great! I love Halloween! !